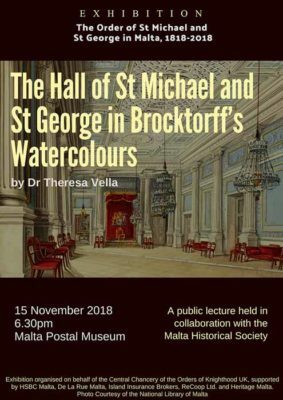 An exhibition celebrating the association of the Order of St Michael and St George with Malta. 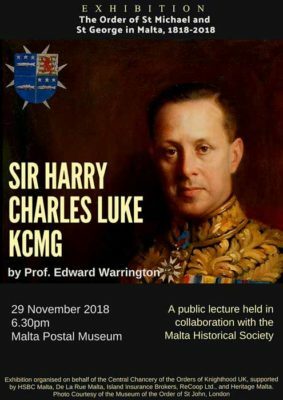 Established in Malta and Corfù in 1818, at the height of the British Regency period, this exhibition highlights the contribution made by Maltese and British subjects employed in the Mediterranean – service that was rewarded with honours, pageant and splendor. 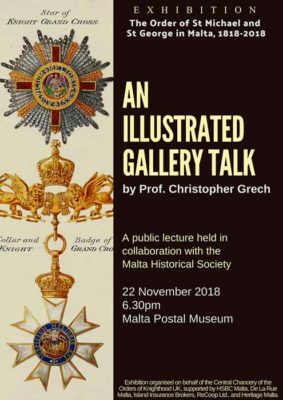 The exhibition will be supported by a series of public lectures on the 9th, 15th, 22nd and 29th November at 18:30hrs by Prof. Chris Grech, Dr. Theresa Vella and Prof. Edward Warrington at the Malta Postal Museum.